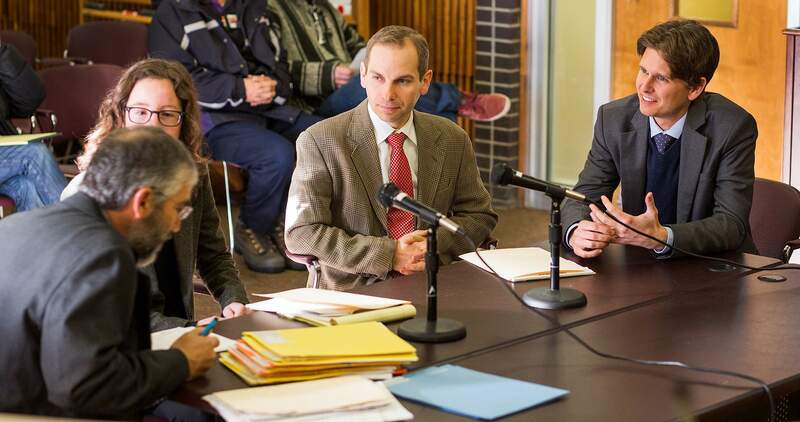 Anthony Nocella, an assistant professor at Fort Lewis College, center, listens as his attorney David Albrechta as Eleni Albrechta, right, consults with Durango city prosecutor David Liberman in Municipal Court Wednesday. Nocella entered a not guilty plea on a summons for parading without a permit and obstructing the streets during an inauguration day protest in Durango. Anthony Nocella, an assistant professor at Fort Lewis College, stands outside the Durango Municipal Court Wednesday morning prior to entering a not guilty plea on a summons for parading without a permit and obstructing the streets during an inauguration day protest in Durango. Fort Lewis College Assistant Professor Anthony Nocella is surrounded by supporters Wednesday morning outside Durango Municipal Court after entering a not guilty plea on a summons for parading without a permit and obstructing the streets during an inauguration day protest in Durango. 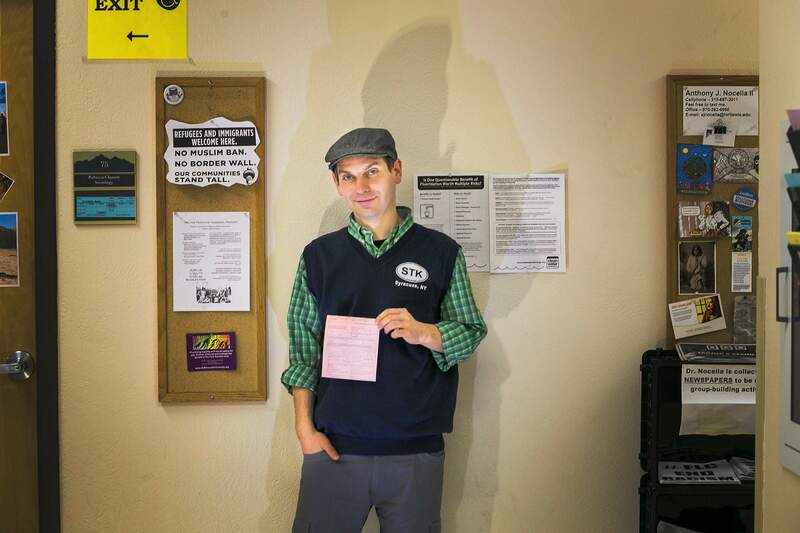 Anthony Nocella, assistant professor of sociology at Fort Lewis College, stands next to his office holding the court summons he was issued by the Durango Police Department for his involvement in a protest the day President Donald Trump was inaugurated. Durango Municipal Court, reserved for minor infractions, rarely sees a crowd such as the one that showed up at the city building Wednesday to support a Fort Lewis College professor who received a summons last month for parading without a permit and obstructing the streets. 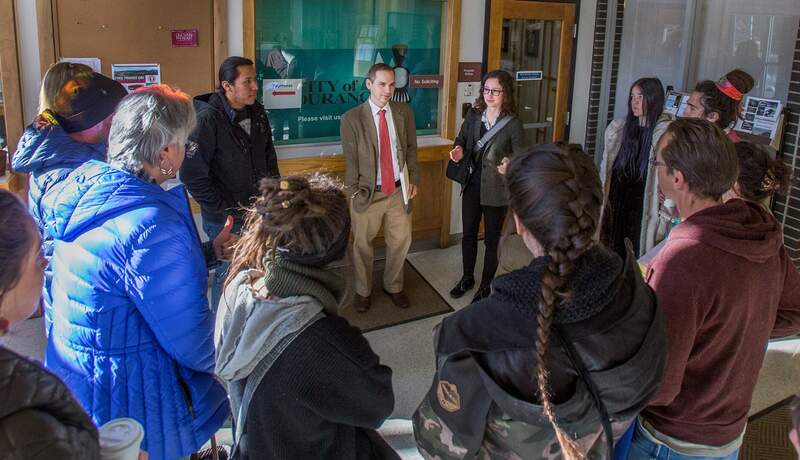 Anthony Nocella, an assistant professor of sociology and criminology, peace and conflict studies, gender and women’s studies, and environmental studies, entered a not guilty plea. About 15 friends and students attended. Nocella, his lawyers and city prosecutor David Liberman deliberated mostly in private, after which Municipal Court Judge Sarah Law set a trial for April 12 in municipal court. The prosecutor offered a deferred judgment, meaning the charges against Nocella would have been dismissed if he received no additional citations over a period of time. The Durango Police Department cited the professor in response to a Jan. 20 march on Main Avenue in protest of President Donald Trump’s inauguration. In a previous interview, Nocella told The Durango Herald he had nothing to do with organizing the demonstration and was not a participant. He said he attended the event to ensure his students were demonstrating safely and responsibly, and he believes he was issued a summons to create a chilling effect on protesters. Nocella has made friends and enemies for melding teaching and activism since he came to FLC in 2015. 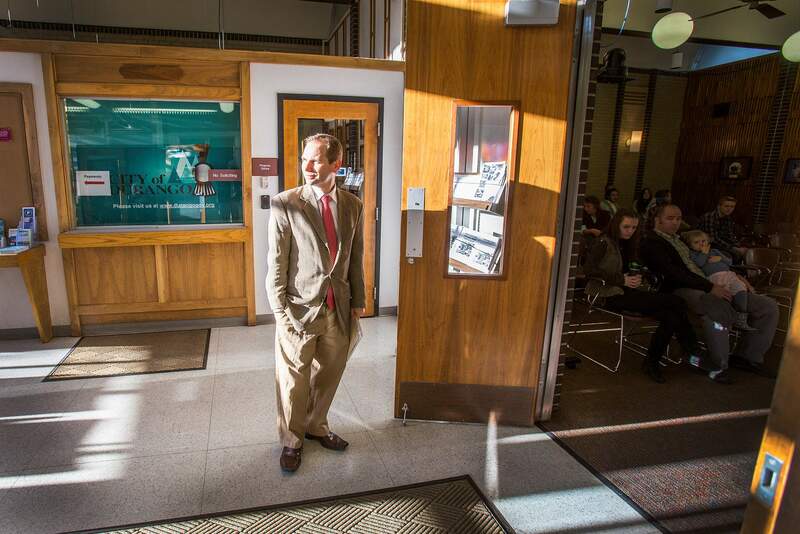 He has been at the helm, or helped coordinate, several demonstrations and social justice endeavors, including a trip with students to Standing Rock in November to stand with those protesting the Dakota Access Pipeline. “He has really inspired people to speak up, and we care about having that voice,” said Tracy Davis, who attended Wednesday’s hearing. Several of Nocella’s students said he is an inspiration to them in a time when they’re concerned about the presidential administration. Nocella’s lawyers, Dave and Eleni Albrechta, had little comment on the open case. “Our client believes he’s not guilty,” said Dave Albrechta. The trial is set for 10:30 a.m. April 12 in Durango Municipal Court, 949 East Second Ave.